Have you heard of spore-based probiotics? They’re a scientifically-proven type of healthy bacteria that can resolve gut issues. It turns out that 95% of good bacteria found in yogurts and most other supplements do not survive past the acids in our stomachs. In other words, most probiotics are completely ineffective! If you’re wondering what kind of probiotic you should take that can actually work to improve digestion, then you’ll love this new podcast episode of Clean Eating for Women. 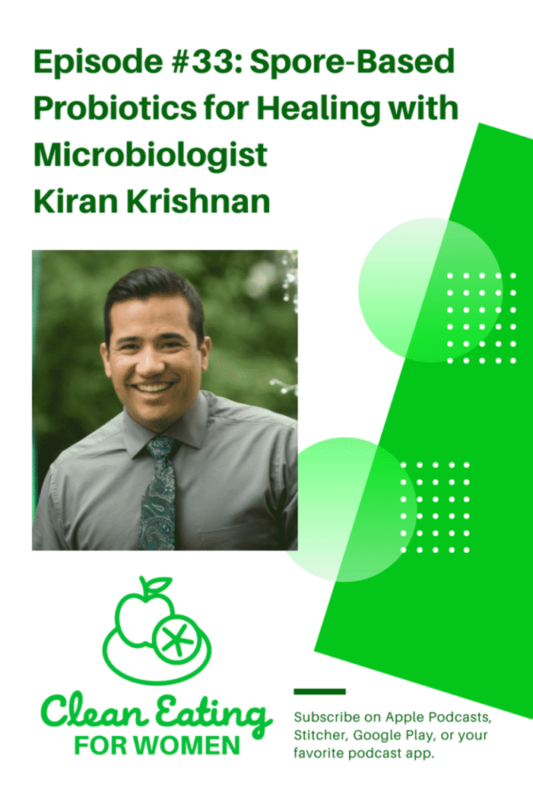 Kiran Krishnan is the Chief Science Officer at Just Thrive Probiotics. He is a research microbiologist that has been in the industry for 16 years. He came on the Clean Eating for Women podcast to explain spore-based probiotics and how they are completely different than regular probiotics. Or, you can purchase Just Thrive right now! Use this link to shop and buy now. 21-Day Clean Eating Jumpstart Challenge! Heck yeah I’d be happy to leave a post to enter the probiotic raffle. This is such an excellent blog, loaded with good stuff! I’m happy you entered, Geoffrey! Thanks for the kind words!!! Well deserved. I’m always on the hunt these days for a weapon against my leetle friends the SIBO bugs I seem to have brought back from Ecuador and can’t seem to get rid of. Have taken all sorts of probiotics including soil borne etc and months of VSL#3 at huge doses.. Ish. Thank you. I will give it a listen. I know probiotics is a pretty fraught topic. ConsumerLabs.com has tested a whole bunch of products and most of them contain few to zero viable organisms! Lot of money to be made and pretty much unregulated so pretty much a crap shoot (if you’ll pardon the pun). Wow, what a great question, Steve! Have you seen research that leaky gut is related to myalgic encephalomyelitis? Ohhhhh, that is an interesting question, Deb. I would be interested to know about that possible link too. New followers and I’m loving your recipes! Praying we are able to try these probiotics from thrive. My 12 year old daughter has chronic urinary tract infections and bladder infections and constant stomach pain and her dr has recommended taking probiotics. We have been dealing with this practically since birth with no headway or relief for her. We have tried several probiotics and have found that the ones we tried weren’t making it past the stomach enzymes so they werent doing anything but wasting our money and we are having trouble finding some that actually survive. Thanks for the giveaway and I love your podcast! Crossing all my fingers and my toes. I hope so too, Tiffany. What a scary situation you’ve been dealing with, I am so sorry to hear about that. I am so grateful to be able to share the information about spore-based probiotics. The research is so encouraging about how they can aid in gut healing and potentially help so many of us. So I changed the name of my instagram a few weeks ago and I may have entered the wrong info in the rafflecoper boxes. I do follow both thrive and clean eating kitchen and my correct instagram name is growingupokie. So sorry! I had no idea about the difference in probiotics. 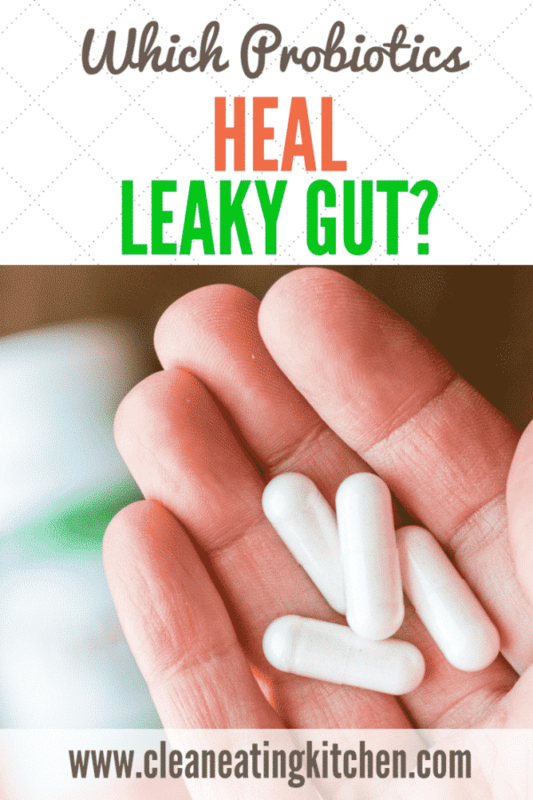 I have leaky gut & Hashimoto’s & it is critical that I heal my gut to obtain my health. A miracle to cure leaky gut in 30 days is a blessing. Even if I don’t win the raffle I am so going to buy this brand. Thanks for sharing this information. I finally feel like I have some hope in my recovery. Thank you for the post. Kiran has been a wealth of information for me during the past couple of years. I’d like to learn more about heart health and diabetic issues. My dad keeps having strokes and each time it debilitates him more. He’s in rehab right now and when he gets out I want to help make changes for him. Oh how scary, Annette! Sending love to you and your dad!!! Fairly certain I have Leaky gut and IBS according to my Functional dr. I was just diagnosed with hypothyroidism and am wondering if I have hashimotos now. I would love to hear more about supplements for healing Leaky gut and how to lower cholesterol. I have heard such wonderful things about this probiotic and would love to try! I feel like I have tried so many and haven’t felt much improvement. Thanks for a fun giveaway! Thanks for sharing, Alexandra! I’m sorry to hear you’re suffering, I know how debilitating hypothyroidism can be. I’m glad you entered the giveaway! I’ve been thinking a lot about probiotics lately because of complications with my fibromyalgia. Thanks for this post! I’m glad you entered, Nicole! Thank you for sharing more about spore probiotics! I would love to hear more about nutrigenomics. I credit probiotics with helping me kick my IBS after so many long years of suffering. I have taken many different types but haven’t heard about the the spore based so this was new info for me. I am diving deeper into all types of pain management techniques and would like to learn more about them. Even though I’m in the medical field, I feel the less pills we need to take, the better! I know pain management is such a huge health issue but I’m loving all the new and updated info I’ve learned so far. Probiotics that can cure leaky gut sounds like a miracle. I am going to look for this brand. I have leaky gut & Hashimotos. I didn’t realize that some probiotics did not survive. I will put my name in, but even if I don’t win this brand sounds like I can win the war on leaky gut. Wow – everything? How about adrenals, thyroid, superfoods, autism…..I could go on and on. I would like to learn more about heart health for women. Symptoms are different for women. what are some good supplements to help protect our hearts? I would love to learn more about adrenal fatigue and how it relates to hormonal imbalances. I’m currently dealing with some health issues that seem to be circling around these two topics and I’ll take all the information I can get! This is such an awesome post, thank you!! I’m a fan of probiotics & have definitely seen benefit from taking them daily, BUT I know there are a lot of issues with regulation & products living up to claims. Plus it certainly does make sense that most probiotics cannot make it past our stomachs. 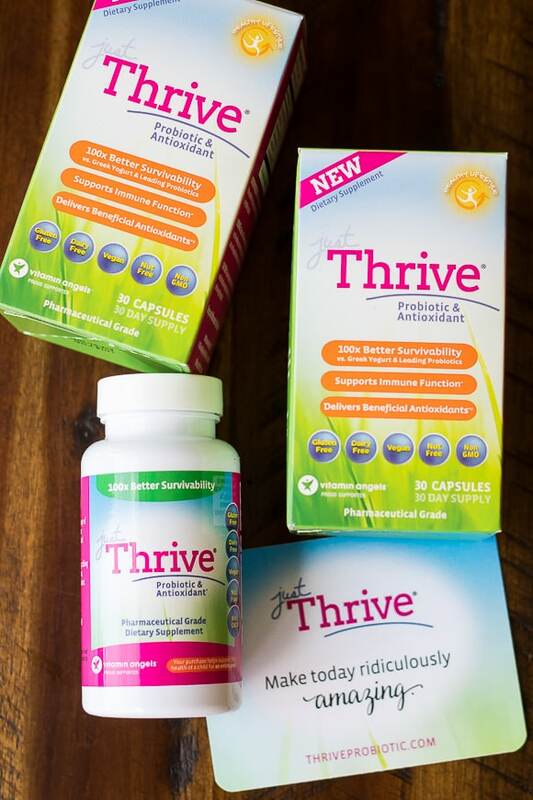 I’ve had immune issues this year – I believe due to some things in my living environment that are out of my control for the time being – and would absolutely love to try Thrive. I would be super curious to learn more about lymphatic drainage & how toxins held in the skin/tissue affect us, especially since I started dry brushing my body earlier this year. I’d love to hear about anything that could benefit my health, really! I would love to learn more about the link between gut health and mood! I suffer from severe depression and anxiety. It would be wonderful to alleviate those symptoms. I would like to know more about treating arthritis and dealing with inflammation. My main concern besides my health is my heart. But I think most of the time when my chest is hurting is because of my gut and gas. I could go into more detail but I wont. I would love to try these. My doctor told me to try that yogurt a while back. I did and it helped a little but I also have gallbladder problems rising. I am not sure what foods are causing the trouble. So for now I am sticking to a broth like diet and its messed my gut up again. I have an appointment soon. I am just pretty sure she will say go for the probiotics. I am really interested in learning more about brain fog. I’m interested in learning more about brain fog and how to get rid of it – maybe first by identifying what can/is causing it? « How to Make Butter Coffee Fast!